Our community has many interactive activities outside of the liturgy. One of them, which we have done for several years, is to produce family plays. These plays are based on either the Bible stories (Creation of the World), or on traditional holidays, like Nativity. 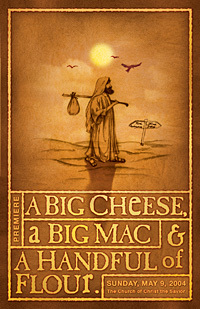 Our most recent play, performed on May 9, 2004, was entitled A Big Cheese, a Big Mac, and a Handful of Flour. It was based on the life of prophet Elijah, as recorded in the book of I Kings. The play consisted of three acts. In the first act, the prophet predicts the dry season to the disobedient king (the king is the Big Cheese of the title). In the second act, the prophet receives God’s gift of bread and meat in the desert (this is where the Big Mac part of the title comes in). In the third act, Elijah performs a miracle by multiplying the last bread and oil in the widow’s house (the Handful of Flour part of the title). The play completes with a short prayer to rely on God in difficult times. The actors and the directors faced several challenges to prepare the play. How should a wild king and a faithful, yet tender, prophet be portrayed? How to make the right decorations? How to make the narration flow in both English and Russian simultaneously? How to emphasize the final message of hope, without leaving the fun and playful mode of the play?